Having a baby doesn’t mean you have to give up your healthy lifestyle. You can run with your babies which is also an excellent way to lose weight after pregnancy. But to do that you need properly chosen, safe and top-quality jogging stroller. 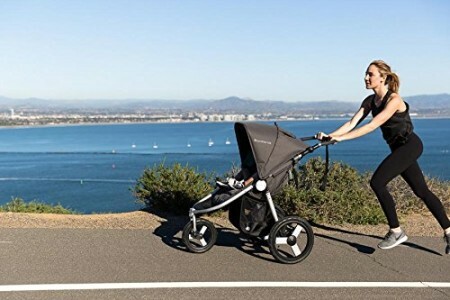 Below you can find my ranking of best jogging strollers for 2019 and my buying guide which will help you to decide which model is right for you and your kids. Me and my husband love being active. Sport, especially running is very important part of our life. We jog, run marathons and half marathons. That’s why good jogging stroller is crucial for us. No matter if you’re looking for a single stroller jogger or double running stroller, you’re in the right place. Tire pump and parent organizer included! Psst! Are you looking for a jogging stroller for twins or two kids of different age? Skip to my ranking of the best double running strollers. 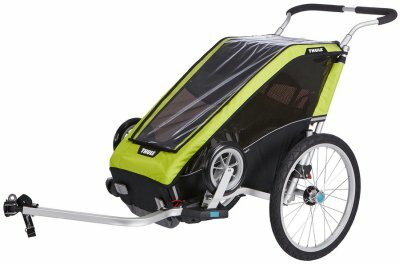 BONUS: Multi-sport trailer as an alternative for jogging stroller? Having a baby doesn’t mean you have to give up jogging! Why jogging with a stroller is beneficial? 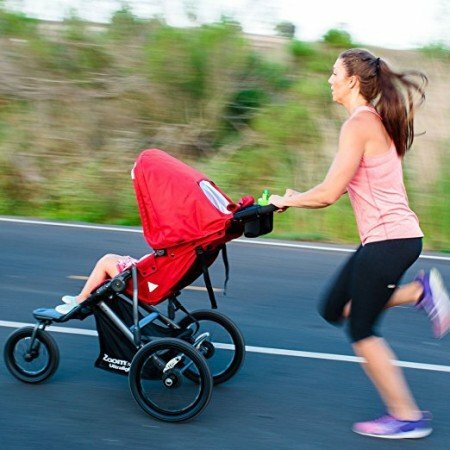 Let’s find the best jogging strollers! On the market there’s many running strollers, but to be honest not every model is safe enough for jogging with it. 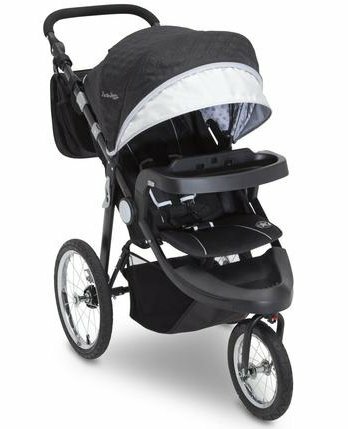 To my ranking I’ve chosen only the best jogging strollers, that are made of quality materials and have features that provide safe ride. 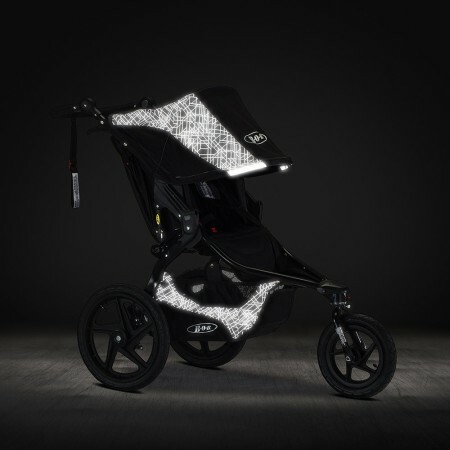 BOB Revolution Flex is one of the most popular jogging strollers in the high price range and the version with reflective Lunar fabric is even more awesome! It’s not only one of the top joggers but also one of the best strollers of 2019. Lunar fabric glows in the dark to keep you and your baby safe and visible in low light. It’s perfect for parents who like strolling or jogging in the evening or early in the morning. Moreover it has adjustable suspension system – probably the best on the market. Thank to it, this jogger provides ultra-smooth, cushioned ride, no matter if you go over cobblestone, gravel, grass, sand or wooded trails. You can also adjust the suspension to your baby’s weight. It rolls like a breeze also thanks to big wheels with air-filled tires. Front wheel is 12.5″ (bigger than other models have) and the rear wheels are 16″. Like in other jogging strollers, front wheel swivels which makes the stroller more agile and easier to turn, but it also locks for added stability during running and walking over bumps. There’s also single action brake, very easy to set and release even in flip flops. Big plus for BOB. There are few other things that I like about this stroller. It has 9-position adjustable handlebar that can literally accommodate parents of all heights and a safety tether. There is also oversized canopy that goes really low and covers the baby down to the knees. It has also a peek-a-boo window. The seat offers deep recline – useful when your toddler wants to take a nap during stroll. The newest model has also improved the reclining method which is now one-handed. The seat has weight capacity of 75 lbs. There’s also very big storage bin underneath the seat which can easily accommodate large diaper bag. Although this is a high-end product it has few drawbacks that I have to mention. First of all, it doesn’t come with accessories so if you want to add an infant car seat, parent or child tray you need to spend extra many on them. Small footrest is another disadvantage. And the thing I dislike the most is 2-step folding. It’s not very difficult, but it’s definitely harder than in many other models. Folded BOB Revolution Flex is also bulky so you may have problems with fitting in to the trunk if you have a small car. It’s weight – 28 lbs, is decent (typical for this type of strollers). BOB Revolution FLEX has A LOT of positive reviews at Amazon and parents love all versions (with and without the lunar fabric). If you’d like to check only the opinions of FLEX with lunar fabrics click here. Here is my summary and list of features that parents praise and complain about. Generally speaking BOB Revolution FLEX (regardless of the type of fabric) is one of the best-selling joggers, highly rated by other parents. The price may vary a bit for different color versions so don’t forget to check all options. Click here to check the customer reviews and current price of BOB Revolution Flex. This big stroller may be difficult to store or transport, especially if you have a small apartment and small car. Moreover, it’s one of the most expensive single jogging strollers (but it is an investment for years). 1. 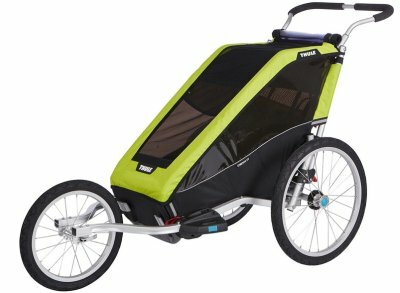 If you’re a serious and advanced runner and love off-road trips this stroller is definitely for you. It has probably the best suspension system ever. 2. It’s one of the easiest to push strollers. You can steer it with one hand and you won’t feel the weight, even if you have a heavy 3-year-old in the seat. 3. Thanks to reflective fabric you will be really visible in low light. Psst! There is also another great jogging stroller from BOB Revolution – PRO 2016 model. It has the same features like FLEX with one exception – PRO has additional awesome handbrake. It’s very useful for those how like hiking and jogging in hilly area. You can read more information in my full review of BOB Revolution PRO or you can just check its current price at Amazon. Chicco also offers top-quality jogger with many useful features in a medium price range. To be honest, it may be the best equipped jogging stroller at this price. What distinguished this jogging stroller from other models at this price is the removable seat. You can detach it from the frame and switch it for KeyFit or KeyFit 30 infant car seats. Of course you can also install the car seat into the regular seat and use two canopies to fully protect the baby from sun, wind and rain. 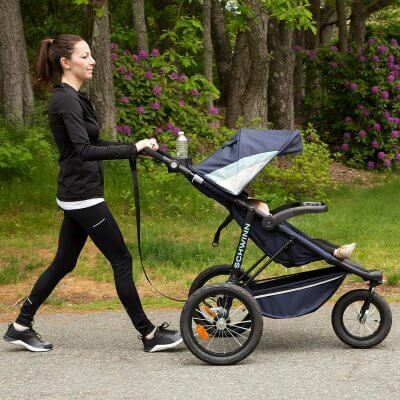 It’s really awesome that this jogging stroller has two ways of creating travel system. So you can actually use this stroller since birth – through first 6 months only for strolling with an infant car seat, and then switch it for the regular seat and use the stroller for all-terrain walks and runs. Let’s take a look at other features. It has 3 spoked wheels with pneumatic tires. Front one is 12″, the rear ones are 16″. Another awesome function is that you can switch between locked and swivel front wheel using the hand activation from parent console. You don’t have to bend and touch dirty muddy wheel to lock it. It’s really great that a medium price range stroller has this feature. Chicco TRE Jogging Stroller has also adjustable FlexCore suspension so you can choose firm ride when you’re jogging and soft ride when you’re strolling over bumps and debris. The suspension is foot-activated. Adjustable suspension is a big advantage, especially that other strollers at this price don’t have it. What I also like about this jogging stroller is the handbrake which doubles as a deceleration brake that allows you to slow down at any time and fully control the speed and as a parking brake that lock the rear wheels in place. Moreover, there is an adjustable handlebar with 4 height settings. 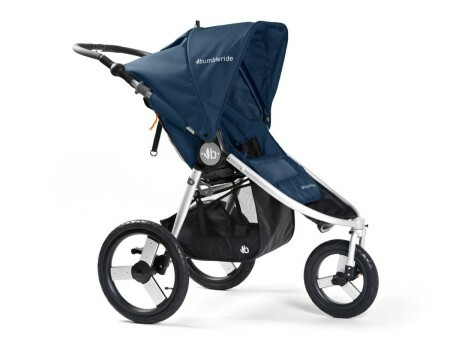 It’s also very rare feature among jogging strollers at this price range. There is also a safety tether attached to the push bar to prevent the stroller from running away from you. Chicco TRE is pocket-friendly, yet it has many features of high-end models! The main seat has multi-position recline and you can adjust the back rest with one hand. There’s an extendable 3-panel canopy which provides really nice sun coverage. There’s a plastic and mesh peek-a-boo windows with magnetic closure. That’s not all! This stroller has really reasonable price and comes with two accessories, that many high-end products don’t include. It is equipped with parent console that has two beverage holders and one pouch (for your key and phone) and a belly bar that also serves for installing the infant car seat. Now let’s talk about the size and weight of Chicco TRE. It weighs 28.5 lbs which is not a little, but it is a typical weight for joggers. Moreover, this jogging stroller feature one-hand fold with self-stand for easier storage at home and quick-release wheels for easier transportation in car trunk. If you have small trunk this stroller may be too bulky to fit in, but detaching the wheels should help. This stroller is only getting more and more popular recently. 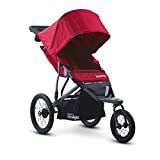 I checked it at Amazon when I was creating this ranking of the best jogging strollers for 2019. There are a lot of positive reviews. You should check if there are any new reviews on your own, because it changes really quickly. Just click here and skip to customer reviews at Amazon. Below you can see what features parents like and dislike. If you have small car you are going to struggle a bit to squeeze it in and you’ll need to fold down the front wheel to make it more compact which means getting hands all dirty. If you have big car trunk you won’t have that problem. 1. It’s probably the best equipped jogging stroller at this price. It’s convertible and has many versatile features like the most expensive strollers but at much affordable price. 2. Many moms use it as primary and only stroller: since birth with infant car seat for long walks and when the baby gets older for jogging. It helps to recover physically (and mentally) after the pregnancy and lose weight. 3. It’s one of the few jogging strollers that has a removable main seat and converts into a car seat carrier. 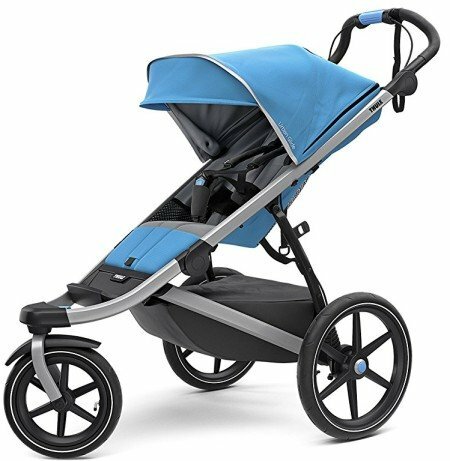 This is one of my favorite models in this ranking of the best jogging strollers for 2019. 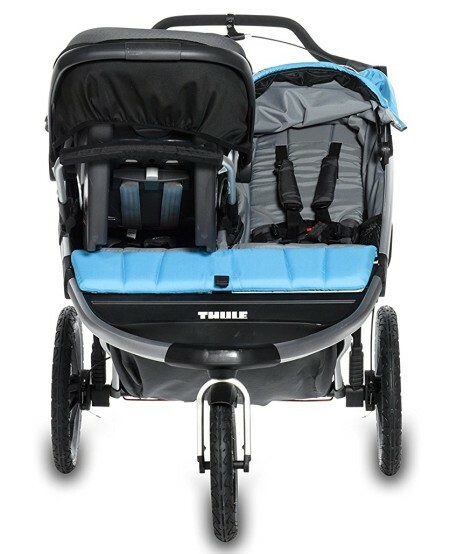 Thule knows how to make a heavy-duty and safe stroller. 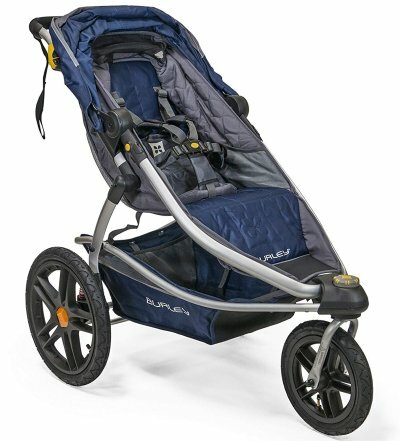 Frist of all, it weighs only 25.3 lbs which makes it one of the lightest running strollers on the market. It’s easier to lift and put in the car trunk or carry down the stairs than other models. This model is also very slim and easily goes through normal doorways and elevators. There is nicely padded seat with vented top and near-flat recline so your child can comfortably nap on-the-go. This stroller is equipped also with extendable sunshade which covers baby down to the knees. It can protect baby from all weather conditions. There is also a peek-a-boo window that closes with magnets. What many parents like about Thule Urban Glide is the adjustable ergonomic handlebar. It rotates from 35.5″ to 44″ from the ground and makes pushing easy for all-height parents. Thanks to it you won’t stoop over the stroller and you don’t have to worry about wrist pain. This running stroller has 3 wheels with air-filled tires. Inflating is easy to do and you can use normal bike pump for it. Front wheel is 12″, the rear ones are 16″. As in other joggers the front wheel swivels to provide you with better agility and locks to create longer and more stable wheelbase – designed for jogging and going over harsh terrain. It has only a foot-operated parking brake. There is also rear suspension that cushions the ride over gravel and unbeaten roads and a safety wrist strap. 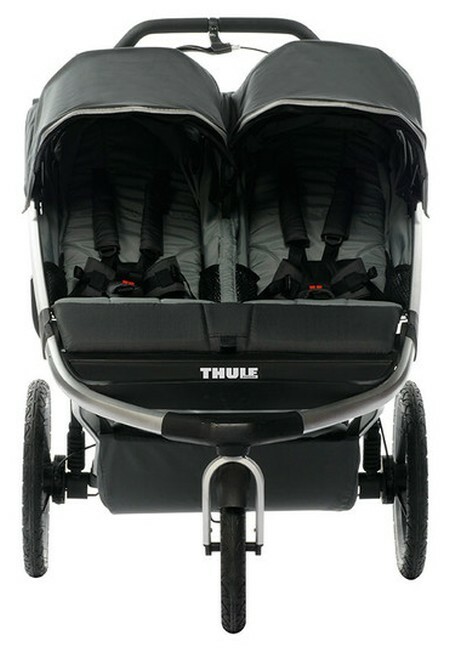 Thule didn’t forget about one more important thing – when we go out for a jogging session with the baby, we take a lot of stuff and need large storage space. This jogging stroller provides parents with spacious basket under the seat. It has also zippered cover made of water resistant material. It is noteworthy that the new model – Thule Urban Glide 2.0 from 2018 is an upgraded version which is equipped with a handbrake – perfect for controlling speed on hilly terrain. Another difference between this and the older model is the canopy – now it is made of UPF 50+ material to provide even better protection from the sun. The new Thule Urban Glide 2.0 weighs a little more than previous Urban Glide (about 2 lbs more). You can compare prices for both models and different color versions at Amazon. Here is the regular Thule Urban Glide and here is the Thule Urban Glide 2.0. If you want to read more about the new Thule Urban Glide 2 read my full review. Urban Glide 2.0 has been released last year and doesn’t have many reviews at Amazon yet (which I’m sure will change quickly), so I checked the regular Thule Urban Glide customer reviews as well. Both models are very highly-rated and have lots of positive review. Don’t forget to check current number of reviews and overall rating of both versions. In the table below you can see what parents love and complain about most often. Unfortunately none of the models of Thule Urban Glide comes with any accessories. Snack tray, cup holder, parent organizer or rain cover are sold separately. If you want to turn this stroller into a travel system you need to buy special infant car seat adapter which is also sold separately. You can check the accessories at Amazon and see if there are any discounts available (for example, here is the rain cover). 1. It’s not bulky like other joggers. Thanks to such a lightweight and compact design this jogging stroller can be also used as an everyday, urban stroller. 2. It’s easy to put in the car trunk and doesn’t take up the whole space – perfect for parents who have small cars. 3. For such a high-quality and nicely equipped running stroller the price is really reasonable. 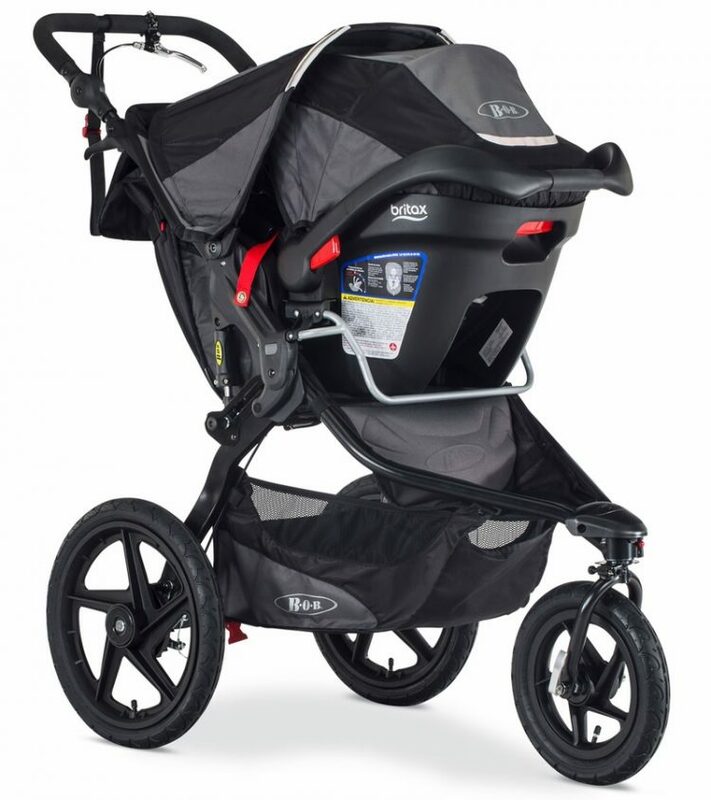 This is one of the highly-rated jogging strollers in a medium price range. 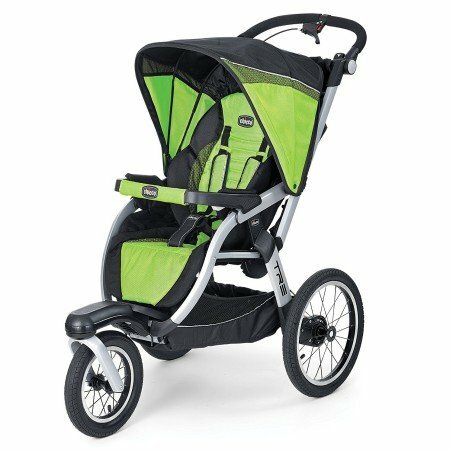 It has tons of awesome and unique features therefore I couldn’t miss it for my ranking of top strollers for running. It has three impact-resistant wheels with pumped tires, like many other models on my list. There is a lockable and pivoting front wheel. 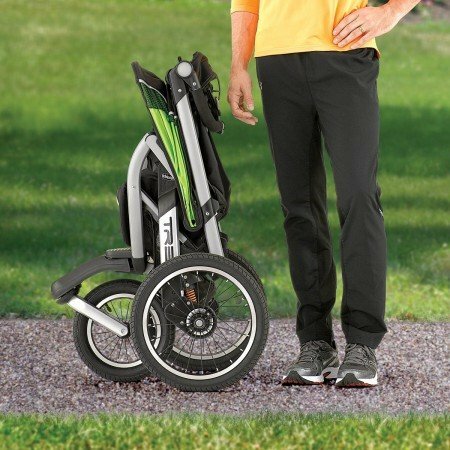 It’s 12.5 inch big and equipped with adjustable tracking to prevent veering off the course. The rear wheels are 16 inch big. Coupled with the coil-spring suspension system it provides very smooth ride over any type of terrain. According to many parents this running stroller maneuvers superbly. It’s easy to push on bumpy, harsh terrain even with bigger and heavier toddler. In fact, you can take this stroller on any type of terrain and you’ll be pleased with its agility and smooth ride. The seat can accommodate a child up to 75 lbs and 44 inches which ensures long usability. Some parents use it even for 5-year-old kids! You can recline the seat with one hand – there is a strap with buckle that you need to squeeze to lower the backrest (for lifting it you will need two hands). The recline is not as generous as on other strollers in this ranking. But it should be enough for resting or even napping during a stroll. There is also mesh seat top that provides nice ventilation. You can use it when the seat is reclined or simply cover it. The seat interior has comfortable padding and rubberized footwell that is easy to clean from muddy shoes. Burley Design Solstice Jogger is equipped with a patented Spring Integrated Technology (S.I.T.). 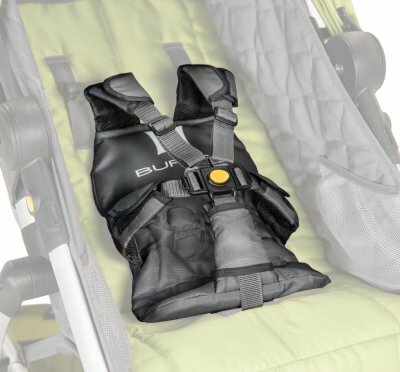 This is a special padded insert with 5-point harness – the straps are designed to pop up out of the way when you press the release button in the middle. This technology simplifies getting the child in and out of the seat – it will be a game changer if you have a frisky and squirmy toddler. The insert also gives additional support for baby’s back. And when the S.I.T. Seat gets dirty you can easily clean it by throwing it in the washing machine. Easy-peasy. I’m impressed with the canopy size on this jogging stroller. There are two panels plus additional sun visor. You can extend the hood even further by unzipping the third panel. This way the canopy provides lots of shade for the little adventurer. Another nice feature is the peek-a-boo window with magnets that secure the flap in open and closed position, so it’s not fluttering when the wind blows. What distinguishes Burley Design Solstice among jogging strollers is the handlebar. This is the only jogger that is equipped with a telescoping handlebar! You may want to ask what’s so special about it. Well, of course it useful to have a handle that can be adjusted to different heights. Trust me, it’s annoying to push a stroller that is too high for you and causes wrist fatigue, as well as having the handle to low and constantly slouching over it. It’s inconvenient during the stroll and even more frustrating when you’re jogging. 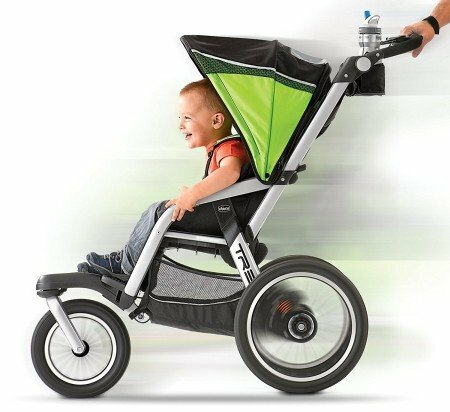 But having the extendable handlebar (instead of rotating one which is most common among joggers) is even better because it gives more space behind the stroller for tall parents with long legs. Therefore they don’t kick the back of the stroller while walking or running. PRO TIP: Burley Design Solstice Jogger is available also as Certified Refurbished and this version is much, much cheaper! Check this offer here. One of the biggest advantages of this running stroller is the storage space. There is a large cargo basket under the seat where you can easily fit big diaper bag, baby blanket and your jacket. There are also two mesh pockets inside the bin for small items, snacks or bottle of water. But that’s not all. On the back of the seat we have another mesh pocket – this one is really big. You can use it for keeping your wallet, phone and other valuables at hand. There are also very useful side pockets inside the seat, where you can put a sippy cup or some snacks for your little rider. Now let’s talk about stroller weight and fold. Burley Design Solstice Jogger weighs 29 lbs which is not a little. On a positive note, when it’s folded you can roll it. This running stroller is easy to fold with one hand. There is an automatic lock and self-stand. The stroller is big even when folded therefore you may need to take off the rear wheels to squeeze it into the car trunk. Fortunately, the wheels pop off easily. 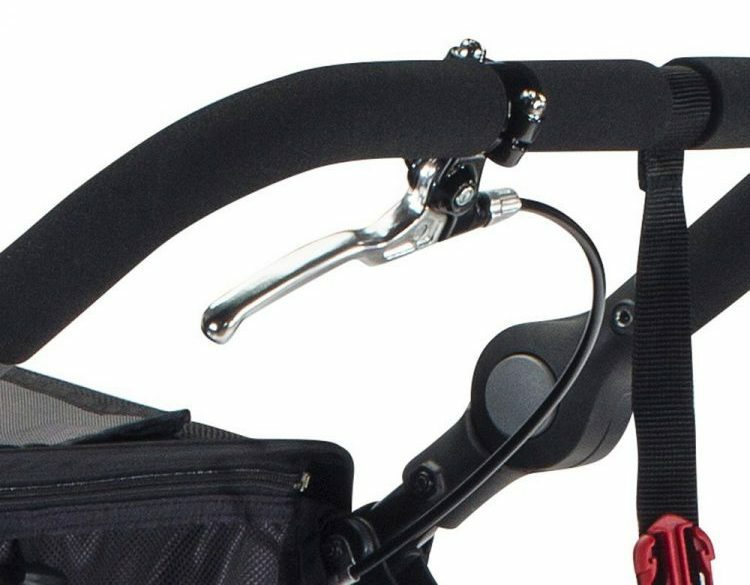 PRO TIP 2: To prevent the seat from flopping out when the stroller is folded, slide the handlebar in, to the lowest setting. Then you’ll be able to tuck the seat under the handle, after you fold the stroller. 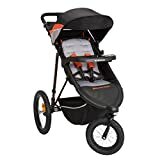 I checked this jogger stroller at Amazon and I must admit that – parents say many good things about it and some of them recommend it over more expensive BOB. In the table below you can check features they love and few minor drawbacks. All accessories for this stroller are sold separately. If you’d like to add an adapter for infant car seat, weather shield, handlebar console, travel bag or snack cup, you need to spend extra money. 1. This jogging stroller has one of the biggest cargo baskets ever – you will have enough space for all of your stuff even for a day trip. 2. Thanks to S.I.T. technology you won’t have any problems with getting your frisky toddler in and out of the stroller. 3. You can stroll and jog with it on multiple types of terrain and enjoy smooth ride. 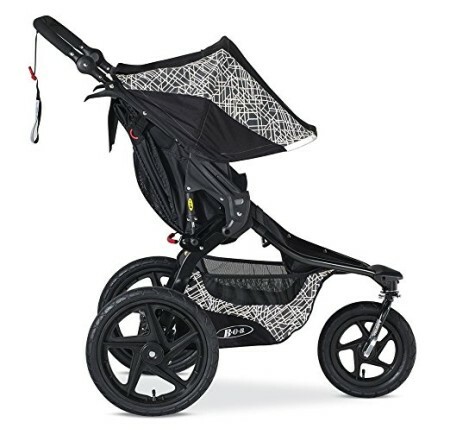 This medium price range jogging stroller won’t disappoint avid runners. This is the most expensive and fancy single jogging stroller in this ranking. It offers many versatile features that make it suitable for everyday use and workout sessions. But is it really worth the money? It has 3-wheel construction and air-pumped tires like other models. Great thing is that it includes tire pump (at this price it would be weird if it didn’t). There is one useful feature that is rare among joggers. It has Speed 3 Steering System which offers three setting for the front wheel: full lock for running and the toughest terrain, partial 30 degrees swivel for light jogging and 360 degrees swivel for walking and everyday use. 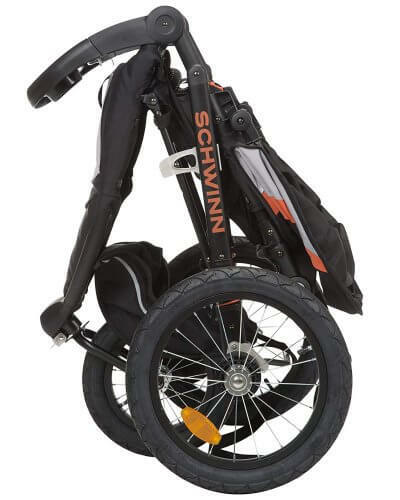 Front wheel is 12″ and the rear ones are 16″ which is typical among jogging strollers. There is also all-wheel suspension that soak up bumps on the road. This model has really great performance and resistance when you’re moving at speed. I also like that it weighs only 26 lbs which is really nice as for a jogging strollers. It has light aluminum frame. Folding is fairly easy and 1-step. This stroller has also automatic lock and stands on its own when folded. However, keep in mind that is stands on the handlebar which may get dirty or rip if you put the stroller on rough ground. I like that the fold is pretty compact, especially for such a big jogger. It should fit in most of the car trunks. Folded Speed is smaller than BOB Revolution FLEX or Graco FastAction Fold. Another feature, which may be a big advantage at least for some parents, is the eco-friendly fabric and lack of harmful chemicals on this stroller. You can read more about it on brand’s official website. I also like the Bumbleride Speed seat which is softly padded and has single-lever recline. There is also vented backrest with a cover. Adjustable handlebar has 5 height settings and safety strap that you can put around your wrist. The canopy is large and goes pretty low, however I’m not sure it will cover the baby knees. It is made of material with UPF/SPF 45+ protection. There’s also peek-a-boo window that closes with magnets. This jogging stroller has really spacious basket under the seat with a pouch for the tire pump. This bin should easily accommodate even large diaper bag. There are also few other storage pockets. On the back of the seat there is a mesh beverage holder, mesh pouch for small items and a zippered pocket for your phone and keys. Inside the seat there is a pocket for baby’s snacks or favorite toy. Bumbleride Speed has one more asset. The main seat can be detached and switched for an infant car seat. So when you add the car seat this stroller won’t get much heavier or bulkier (like when you attach the car seat to the regular seat). This Bumbleride stroller is compatible with many car seat brands: Maxi Cosi, Cybex, Nuna, Graco and Chicco (adapters are sold separately). Thanks to that you can use it from birth as a car seat carrier (for strolls, not running). There is one more feature that distinguished this jogging stroller from other models. It is compatible with a bassinet so it can be used since birth as a pram. Other joggers in this ranking don’t offer carrycots. Of course Bumbleride bassinet is sold separately. This jogging stroller is not flawless. It’s really expensive but doesn’t include accessories (except for the tire pump). If you want to use it with infant car seat, you need to spend extra money on special adapter. Parent tray, travel bag or weather shield are also sold separately. It’s a bummer that Bumbleride Speed is so pricey and you still have to spend extra money on accessories that are a must-have. Let’s summarize. This stroller is high-quality, made of nice durable materials, looks really chic and the overall performance is admirable (thanks to versatile front wheel and good suspension). However, it is high-end product and when you add its price to that the price of necessary accessories you end up spending a fortune on a stroller! If you have big budget go for it, but if you have also other expenses there are other great joggers with similar features and more pocket-friendly price. 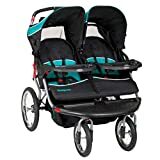 Bumbleride Speed Jogging Stroller doesn’t have many reviews at Amazon – it’s expensive so it’s not as popular as cheaper models. However the opinions are very positive (at least at the time I’m writing this ranking, check how it looks now). Here are the features that parents mention. This jogging stroller is pricey. If you are thinking about buying it, make sure it meets your needs and check what other parents wrote about it at Amazon. You can also find there available discounts. 1. Thanks to awesome wheels and suspension it can handle ANY type of terrain. No matter if you run, jog or walk. 2. It can be used from birth as car seat carrier so it can be really your only stroller. 3. It is made of top-quality materials and eco-friendly fabrics. It is an investment for years. 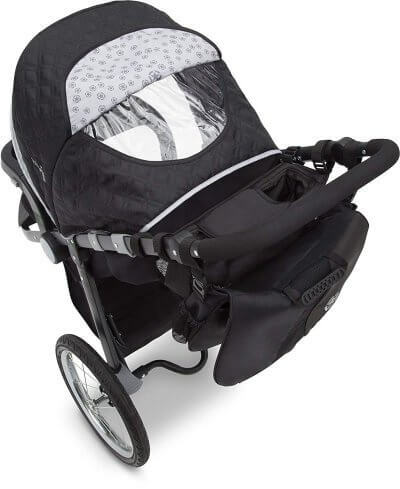 This is very popular, medium price range jogging strollers. It’s lightweight, high-quality and easy to operate. Like other running strollers it has 3-wheel design with 16 inches rear wheels and 12 inches front wheel which swivels for better maneuverability and can be locked for greater stability for running and strolling over uneven terrain. There are pneumatic tires, so you need to remember about inflating them once in a while. What’s really great is that the bike pump is included with the stroller. There is a foot-operated parking brake that locks the rear wheels and safety strap for your wrist. 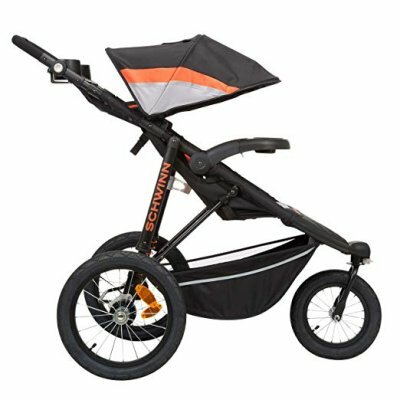 Moreover, it has a shock absorbing suspension which makes this stroller jogger suitable even for dirt, unbeaten roads as it smooths the bumps. 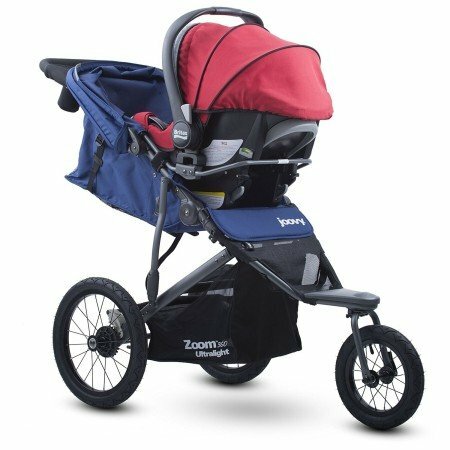 What most of parents love about Joovy Zoom 360 Ultralight is its lightweight aluminum frame. The whole stroller weighs only 25.7 lbs which is really little, especially for a jogger. The multi-position recline seat can accommodate a passenger up to 75 lbs so you can be sure this stroller will serve you for a long time. There are mesh pockets inside the seat where you baby can keep some snacks or take-alongs. The canopy extends pretty far to give the baby nice protection from the sun and wind. This running stroller can be also turned into a travel system with many car seat from major brands. Adapters are sold separately. Thanks to this function you can use Zoom 360 Ultralight from birth, however remember that you can start running with your baby from about 6 months when he can sit unassisted and hold his head up. Another big advantage of Zoom 360 Ultralight is the storage space: it has large underseat basket and parent organizer (included!) so you can keep your phone and keys in safe, zippered pocket and two bottles of water (or sippy cup) at hand. The best part is that this well-equipped running stroller has really reasonable price. These high-quality features put this jogger in line with high-end competing models. Keep in mind that Joovy Zoom 360 Ultralight comes in 4 color versions: Black, Red, Blueberry and Charcoal. Availability and price may vary for different colors. Before you decide to purchase this stroller make sure to compare prices for all color options. You can do it at Amazon. At the moment of writing this review, Zoom 360 Ultralight has over 200 reviews at Amazon (and most of them are positive!). Here are the main things that parents mention most often. If you want to learn more about what other parents think about Joovy Zoom 360 you can skip to Amazon’s customer review. Although this stroller has high weight limit and can accommodate a heavy toddler or even preschooler, it’s not very comfy for taller kid. The seat back is about 18″ high, there are extra 2″ of netting and there are few more inches to the top of the canopy, so it gives child plenty room to grow. However, if the child has longer torso (over 18″) you won’t be able to recline the seat. 1. It’s light and makes pushing a breeze, even with older and heavier toddler. 2. Tire pump and parent organizer are included so you don’t have to spend extra money on these (essential) accessories. 3. It may serve you for several years and this is also a stroller for big kid. Some parents use it even for 5-year-old kids or older children with special needs. This is my top pick in a low price range. If you want to lose some weight and start jogging, but you’re on a small budget, this cheap jogging stroller is just for you. This stroller weighs 27.2 lbs which means it’s not excessively heavy. Its weight is actually similar to UPPAbaby VISTA’s. Moreover, it has great features for parents convenience: large basket underneath the seat where you can easily fit a diaper bag and included parent console with two beverage holders and enclosed compartment for your valuables (although it may not fit big smartphones like iPhone 6S or Samsung Galaxy S7). You can use it since infancy with a car seat (for strolling) and when your baby can sit unassisted you can start using the regular seat for jogging. 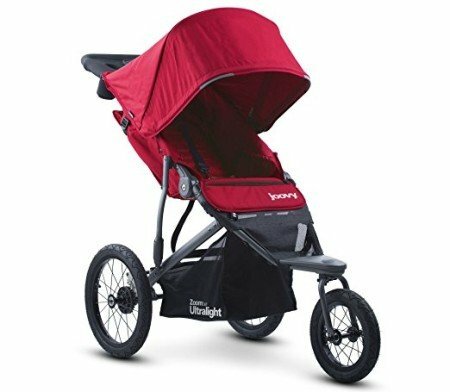 IMPORTANT: If you’re looking for jogging stroller with travel system option, keep in mind that this one is compatible only with Safety 1st Onboard, Eddie Bauer Sure Fit and Cosco Light N Comfy infant car seats. Unfortunately Schwinn Interval doesn’t accept Chicco, Graco and other popular car seat brands. The main seat is suitable from 15 to 50 lbs and it’s nicely padded for baby’s comfort. I only wish the harness crotch strap was padded too. The seat features multi-position recline – it’s not ultra-deep but definitely sufficient for a comfortable nap during the stroll. There is also a convenient child tray with a cup holder and a place for baby’s snacks. It’s really unusual for a stroller to have so many accessories included, especially at this price point! This inexpensive jogging stroller has one more great feature that all petite moms like me will love – adjustable handlebar. You can rotate it up and down, depending on your height. Whether you’re short or very tall you’ll be able to push this stroller conveniently. No more wrist pain, no more slouching over the handle. Now let’s take a look at the canopy. It’s rather small – it has 2 panels and a pop out sun visor so it provides only a decent shade. The whole sunshade can rotate forward, depending on the position of the sun which allow you to always keep the sun rays out of baby’s eyes. However, when the canopy is in lowest position, there is a gap between the seat top and the canopy, therefore the top of baby’s head is exposed. It’s quite a common issue with cheap strollers for jogging. Good thing is that the canopy is UPF 50+ so it protects baby from harmful impact of sun rays. 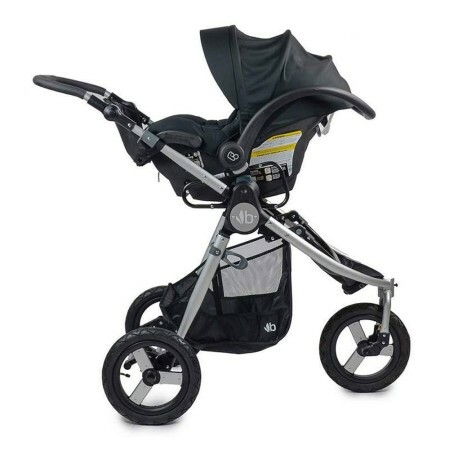 As other jogging strollers, this model has 3-wheel design and bicycle tires which you need to inflate once in a while. Front wheels can be in swivel mode when you stroll, go over tight corners or jog slowly. You can also lock it for more bumpy terrain or when you’re jogging at higher speed. It rolls smoothly over grass and gravel and you can easily go over curbs without any bouncing. It’s easy to push and turn. The shocks work fine, but they are not as good as on Thule Urban Glide or BOB Flex. I would recommend Schwinn Interval Jogging Stroller for daily, average jogging sessions. For more advanced runners, who like long distances and running on dirt trails I would recommend these high-end models. Especially if you like running on hilly terrain – choose a jogger that is equipped with a hand brake. Schwinn Interval lacks this feature therefore it’s not perfect for running mountain trails. Most users agree this jogger folds in half fairly easily. But to fit the stroller in a car trunk you may need to take off the wheels and child tray, as the fold is on the large side. At least the wheels are very easy and quick to release. I check this jogging stroller at Amazon, as I always do. It’s not as popular as Joovy or BOB joggers, but its overall rating is great (you can check the current rating here). The feature that parents mention most often are in the table below. 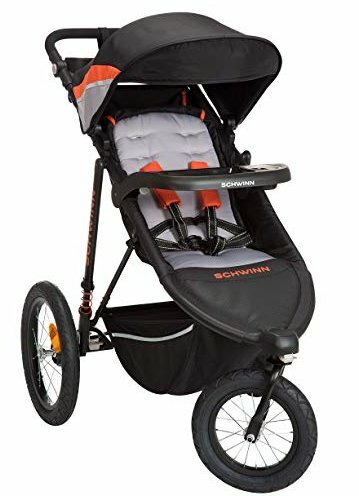 Schwinn Interval may be too big to serve you as an everyday stroller and it’s not good for hiking or advanced running on mountain trails. 1. It’s a good jogging stroller for beginners and those who prefer slow and short jogging sessions. 2. It’s the most cheap (and good-quality) jogging stroller available on the market. You can find the current price at Amazon. 3. It comes with accessories like parent and child tray with cup holder. So there’s nothing more to buy and you can save money! This is one of the cheapest jogging strollers that I can recommend especially for beginners and those how like occasional light jogging. Although it has few small drawbacks it may be a great choice for parents who have to stick to their budget. First of all, it can be a perfect option for parents who want a stroller that in not only for jogging, but can be also used from birth as a travel system. J is for Jeep Brand Cross-Country Sport Plus Jogger is compatible with few infant car seats. SAFETY TIP: The stroller is intended for jogging only when the child has good neck and head control and can seat unassisted in the main seat. The capacity of the main seat is 50 lbs. You can recline the seat into multiple positions by using the cord on the back of the seat. Similar to Schwinn Interval, this jogger doesn’t feature deep or near-flat recline, but the lowest position is great for naps on the go. Some parents complain about the most upright position which is still few inches inclined. Just keep in mind that slightly reclined seat is typical for jogging strollers. There is also a footwell for older and taller kids – it’s not adjustable, but I like that it’s plastic because it’s very easy to wipe off the mud and sand. For child’s comfort there is also big extendable canopy with additional sun visor. When the canopy is fully extended is almost touches the child tray, therefore it covers the little passenger really well and keeps the sun out of baby’s eyes. This jogger stroller has 3-wheel design with 12″ front wheel and 16″ rear ones. 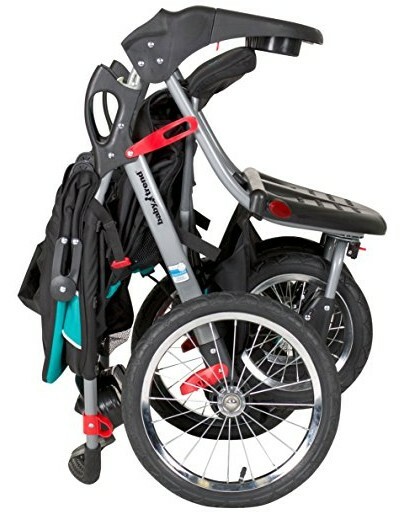 Front wheel swivels and can be lock so you can easily switch from daily strolling (better maneuverability, easier turning) to jogging (added stability). The rear wheels are quick to detach to simplify the storage and transportation. The tires are rubber and filled with air therefore they cushion the ride. 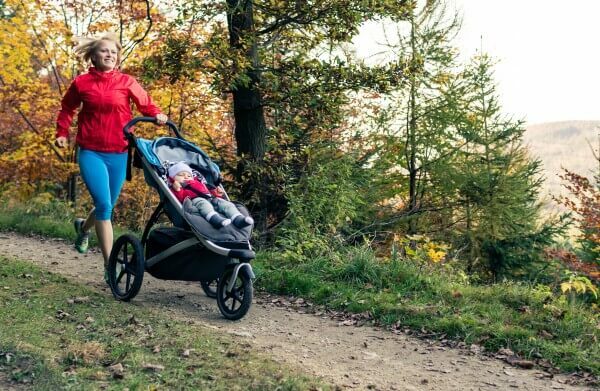 However there is no typical suspension system in this jogging stroller hence it’s more suitable for shorter distances and slow jogging than serious running. This stroller has two-action footbrakes which means you need to press two pedals to lock the stroller. There is one more safety feature – tether for runners wrist, however there is no handbrake. Now let’s take a look at the major advantages of this cheap jogging stroller. It has adjustable handlebar that rotates almost 180 degrees! It makes pushing and steering comfortable for both short and tall parents. Another advantage is the included child tray. Although it doesn’t have separate beverage holder, it is a useful place for baby’s snacks and small toys. The tray is pivoting and removable therefore you can easily take your baby in and out of the seat. I love how well-equipped this jogging stroller is! It has a peek-a-boo window, rotating handlebar, child tray, parent console and parent organizer. You don’t have to pay extra for these accessories! AMAZING! But that’s not all! There are more accessories included in the price. 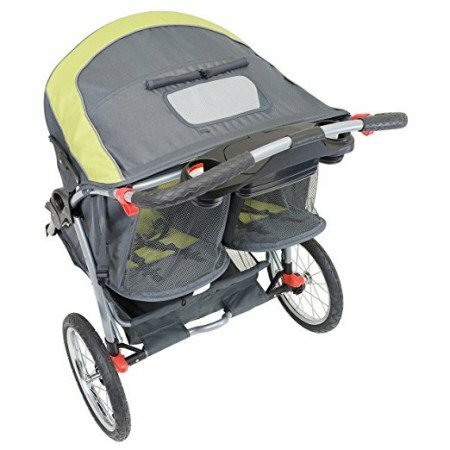 This jogging stroller comes with fabric parent tray that includes covered compartment for your small items like phone or keys and two beverage holders. There is also detachable parent organizer that can even serve you as an alternative for a diaper bag. It has few pockets so you could always have easy and quick access to your belonging. You can actually save a lot of money, thanks to all these included accessories! And if you ever need more space, for example for your stuff for a day trip, you have also a spacious storage basket underneath the seat at your disposal. I really like that this inexpensive stroller for jogging comes with all these accessories. Big plus for Cross-Country Sport Plus Jogger. The fold is not complicated and when the stroller is collapsed in half the dimensions are: 17.5″ x 33″. This affordable jogger weighs a bit under 30 pounds, so it’s rather on the heavy side. Lifting it to the car trunk or bringing it up and down the stairs requires some strength. I checked online reviews – parents speak mostly positively about this model. Here are the things that customers like the most and few drawbacks they mention. Would you like to read customer reviews on your own? You can check them for example at Amazon. 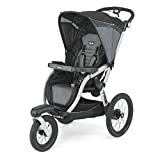 This jogging stroller has travel system option, but it’s compatible only with 5 infant car seats (Graco SnugRide Click Connect, Evenflo Nurture and Embrace, Chicco KeyFit 30 and Britax B-Safe 35). Adapters for Graco and Evenflo are sold separately. This jogger is not compatible with KetFit 2! 1. This is one of the cheapest strollers for jogging, so it’s perfect option for parents on a small budget. 2. It comes with a child tray, parent tray and parent organizer which serves as a small diaper bag. You won’t have to spend extra money on these accessories! 3. It can be your only stroller if you add a compatible infant car seat for the first few months. Are you a parent of twins or kids of different age and you love jogging as well? I’ve got something for you! Parent console, children trays and MP3 speakers – all included! This is the most lightweight double running stroller in this ranking which makes using and storing a bit more easy. Its construction is similar to the single version. Front wheels swivels which makes the stroller more agile and can be also locked for increased stability during running. There is rear suspension that absorbs shocks and provides comfortable ride. Thanks to adjustable rotating handlebar parents of different heights can find comfortable position for themselves (from 35.5″ to 44″ from the ground). The is also an additional brake on the handlebar which allows parent to control the speed when going over bumpy or steep terrain. There is also foot-operated parking brake and a safety strap. Just like the singe version, this double model has large canopies that go really far down. Each has a peek-a-boo window with magnetic closure so you can always check on your passengers without disturbing them. Canopies extend separately and stay in place firmly. Seats are nicely padded, harness strap also have softly padded covers (even the waist straps!). There is also one-handed deep recline. All to provide the most comfortable ride for kids. I love how softly the seat padding is! I like that this stroller is fairly light (as for such a big, heavy-duty vehicle) – weighs 32 lbs and it also features one-handed compact fold. If you also take off the wheels, which is a piece of cake, Thule Urban Glide Double really doesn’t take up much space. I love Thule storage baskets. 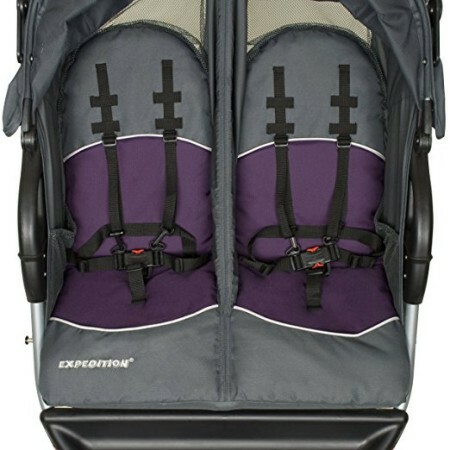 This double running stroller has capacious bin that is zippered with water resistant cover. Your belongings are securely hidden, protected from falling out and getting wet. There are also mesh pockets on the back of the seat and inside each seat (for baby’s toys, snacks or pacifiers). 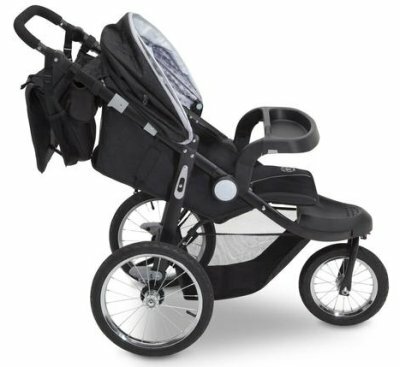 Thule Urban Glide Double Jogging Stroller accepts one infant car seat, however the adapter is sold separately – just like the rest of the accessories. Psst! Thule has also released upgraded version of this stroller for 2018. Here are few new features: completely different twist handbrake and side vents on each canopy. Thule Urban Glide Double 2.0 is however a bit heavier and the price is a bit higher. You can already see this new model at Amazon! 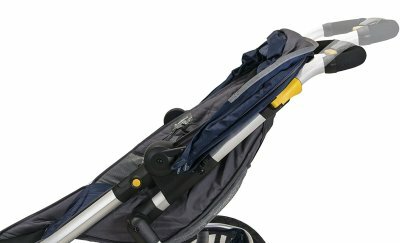 Thule Urban Glide Double is quite popular and highly rated by other parents at Amazon. Here are the main assets and drawbacks that customers mention. Thule Urban Glide Double is available in three different colors and last time I check it at Amazon each version had different price (for example the red version was over $200 cheaper!). Make sure to check the current discounts and compare all prices – you can do it by clicking here. 1. Thanks to very long canopies with vented parts children are well protected from the sun rays and overheating at the same time. 2. It has probably the best storage space among double joggers – it’s huge and closed with a zippered cover. You will be able to fit all of your stuff even for a day trip to the zoo and it will be well protected. 3. It gives parents ability to go wherever they want – it handles all types of city terrain, cobblestone, cracked sidewalks, high curbs, muddy trails, grass and snow. This is probably the most expensive double jogging stroller on the market right now. It’s also very popular among active parents and its functionality is highly rated. 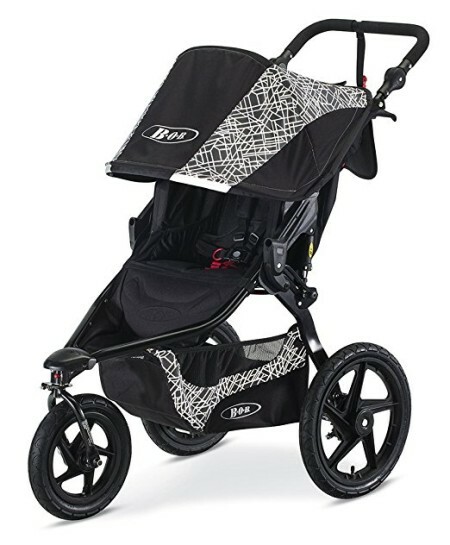 This jogger has almost the same features like the single version and other BOB jogging strollers. It has three wheels with pumped tires, front one is 12″, rear ones are 16″. Front wheel has two settings: it can swivel which increases strollers maneuverability and makes turning more easy (it can be used for walks and strolls over even terrain) or it can be locked which adds stability (you should use this setting for running and off-road strolling). 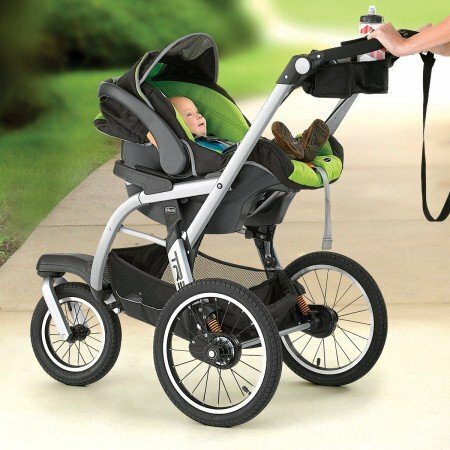 Big advantage of this stroller is state of the art suspension system which can be adjusted to babies weight and type of the terrain you’re jogging/walking on. I like that this model has not only parking brake operated by foot, but also a wrist strap and a handbrake which allows parent to slow down whenever they want. The most important thing is that this brake really works the way it should. It’s very useful feature for parents who like to hike or jog on hilly terrain. I think that handbrake is a must have, especially in double strollers. I can’t even imagine running with such a big and heavy stroller with two toddlers without this brake! Controlling this beast would be really hard with handbrake, especially if you’re petite woman like me. Thanks to large, air-filled tires, suspension system and two brakes you can jog with this stroller wherever you want and it won’t let you down. It will be easy to push for you and your children won’t get bumped around even on gravel, grass, wooded paths or unbeaten roads. You can even take it to the beach. Thanks to smooth, cushioned ride, you can do your workouts and be sure your kids are protected from back pain and spinal diseases. This running stroller has few features that increase parent’s comfort of using. First of all there is adjustable handlebar which rotates from 33.5″ to 50.5″ from the ground. Even very short and very tall parents can find comfortable height. Another feature that makes this stroller convenient for parents is capacious storage bin under the seats. It can even accommodate two diapers bag or few shopping bags. I know how much stuff you need to take when you go out with two kids and I can tell you one thing: with this basket you will be able to take anything you may need during jogging session or a day trip. I also like that seats and canopies adjust individually. It means that one child can lay on the reclined seat while the other is sitting upright. Recline mechanism is one-handed and when the seat is in lowest position you can use mesh vented top (or close it with a cover). Canopies also extend separately. Each has large peek-a-boo window. BOB Revolution PRO Duallie can accommodate one infant car seat (adapters sold separately). As you can see this running stroller is a great option for parents who have kids of different age (for example an infant and a toddler). Here are the main thing I don’t like (and other parents also complain about): folding is 2-step process which is a bit more difficult than in other strollers. Of course this double jogging stroller is big even when folded and many parents remove the wheels to fit it in the car trunk. Moreover this jogger is really pricey but it doesn’t include any accessories, which is ridiculous! You need to spend extra money on infant car seat adapter, parent console, child trays… It doesn’t even include tire pump! It’s a bummer that these must-have items are sold separately. Of course I checked customers reviews at Amazon. At the time of writing this ranking it has over 40 reviews and it seems like jogging parents are really satisfied with it. Here are the assets and flaws they mention. This stroller is heavy (36 lbs) and big – it is understandable because it has to be strong to hold even 100 lbs. However it can be difficult to put in the car trunk or it may even not fit in it (if you have small car). Moreover, if you use it with an infant car seat or with fully reclined seats you should not use it for running, only for jogging. It’s more safe to start running when the baby is at least 6 months old and can sit unassisted in the regular seat in more upright position. 1. This is one of the best jogging strollers for twins. Since it is really well balanced it can be also used for running with an infant and toddler. 2. Although it’s heavy and can accommodate two heavy kids, it’s super easy to navigate, turn and control. 3. According to many parents who have used this stroller, it’s totally worth the money (considering its quality and performance). If you like this stroller and want to read more about its features and performance check out my full review of BOB PRO Duallie. There is also similar model – BOB Revolution FLEX Duallie, which has the same features, except for the handbrake. This stroller is 3 lbs lighter and also a bit cheaper than PRO version. Here’s my full review of FLEX Duallie or you can just skip to Amazon and compare prices for both models. This is another great running stroller for parents of twins or two kids of different age. It has similar features to BOB Revolution PRO Duallie, but it is a bit cheaper. There are 16″ rear wheels and 12″ front one which can swivel or lock. Just like in the single version of this stroller switching between pivoting and locked wheel is very convenient, because you just need to use remote lock mounted on the handlebar. You don’t have to touch the dirty, muddy wheel, here you just flip or release lever. Thanks to this feature you can quickly and easily switch between walking and running mode. Summit X3 Double Jogging Stroller has also all-wheel suspension system that cushions the ride over bumps. I like that this stroller has two breaks – foot-operated parking brake (unfortunately not flip flop friendly) and hand-operated rear drum brakes. Thanks to the additional handbrake you can not only control the speed when you going downhill or running on uneven ground, but it gives you better control over the whole stroller which weighs 37 lbs! Without the handbrake controlling this beast (with two kids) would be really difficult, especially if you like run on tough terrain. Good thing is that this double running stroller has also a wrist safety tether. Each seat reclines individually which is very useful if you have an infant who likes to nap during strolls and a curious toddler who likes to sit more upright. When the seat is fully reclined there is a vented top – very useful for summer strolls. Canopies also adjust separately. I like how far they go and cover the babies down to their knees. There are two peek-a-boo windows on each sunshade and side vents. Handlebar is not adjustable. Many parents worry that a double stroller would be very hard to fold and they would struggle with it every time they want to put it in the car trunk. Thanks to Baby Jogger patented technology folding is super easy and can be done with one hand. After folding is takes up a decent space: 34.25 x 32.5 x 15.35 inches, good thing is that it’s pretty slim. I don’t like that the access to storage basket is blocked by the bar in the middle. This bin is really spacious and can easily accommodate large diaper bag and few other things, but taking it in and out is a struggle. Fortunately there are mesh pockets on the back of the seats where you can keep your essentials at hand. Just like the BOB PRO Duallie, this pricey jogger doesn’t include any accessories either. You need to be prepared that adding parent console or trays for your children will cost extra. 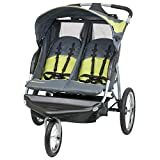 I checked this double running stroller at Amazon to find out what other customers say about it. It has plenty 4- and 5-star opinions! Want to read more reviews written by other customers? Click here and skip to Amazon. Baby Jogger Summit X3 Double Jogging Stroller is not compatible with infant car seat (it doesn’t even accept one car seat), so it cannot be used since birth even for walking. You can only use it when your babies (twins or kids of similar age) can sit and hold their heads up unassisted. 1. The seats are very roomy and deep which makes them suitable for older kids. You can be sure this jogging stroller will serve you for years. 2. It works great not only for twins but also as a running stroller for infant and toddler. And thanks to a bar between seats, one baby can nap without being disturb by the other kid. 3. Last time I checked at Amazon this stroller was on sale! I’m not sure if this offer is still available so better check the current price on your own here. 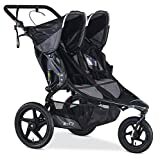 This is the cheapest double jogging stroller on the market, yet it is still pretty well equipped and performs good enough to recommend it for joggers. 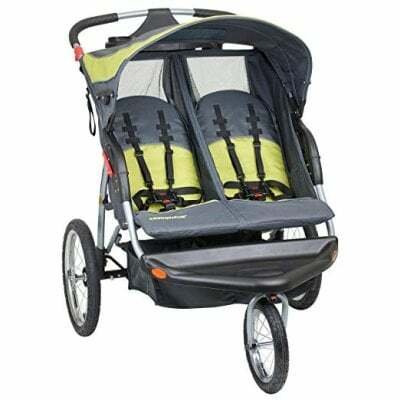 As you may expect double jogging stroller at such a low price can’t have all features that more expensive models have. It lacks few functions and has some drawback, however it still can be a great choice especially for beginners or parents who only jog sometimes and on short distances. It has three-wheel design with pneumatic bicycle tires. 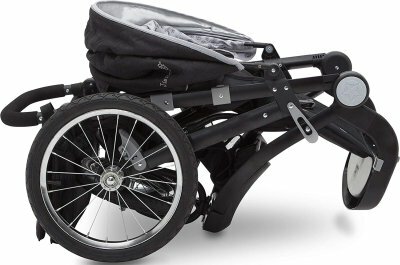 Front wheel can swivel or lock, depending on the terrain you’re going over and if you use this stroller for walking or jogging. There is a safety leash to prevent this jogger from running away from you. Each seat reclines separately and has vented top. I don’t like that harnesses are not padded at all. There is large easy to clean footrest with reflectors on each sides for better visibility in low-light. Now let’s talk about the unique features and advantages of this stroller. It comes with a parents tray that has two cup holders and closed storage compartment – it’s something that the high-end products lack. Moreover it has MP3 speakers plug-in in the parent tray – it’s compatible with iPod and iPhone and other popular MP3 players. We all know that exercising with music is much more pleasant! Keep in mind that not all color versions have speakers. If this feature is important for you and you’re thinking about buying this stroller, here is the model that includes this accessory. I also like the storage space in this jogging stroller. Under the seats there is a big basket divided into two parts. I would prefer one big bin, but these two compartments are also very capacious and can hold a big diaper bag and few other mom’s stuff. On the back of each seat there’s a useful pouch were parents can keep their essentials within reach. Manufacturer also added mesh pockets inside the seats – little passengers can keep there their sippy cups, snacks or pacifiers. Now it’s time for the drawbacks. In my opinion this double jogging stroller has three main disadvantages. First of all, it has one canopy for both seats. I prefer double strollers with two separate canopies, because very often when one baby wants to lay back and nap (or just relax), the other one want to explore surroundings and doesn’t want to be covered with the canopy all the way down, because it would block his view. 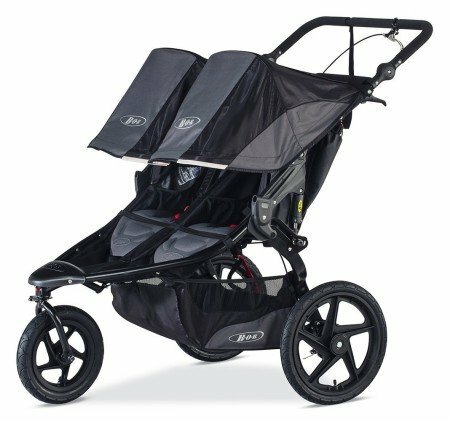 Baby Jogger Expedition Double has ratcheting canopy – it’s rather small however it rotates forward to protect babies from low sun. There is one central peek-a-boo window with Velcro closure. Another drawback is the lack of handbrake. This is a big stroller, it weighs about 32.5 lbs and if we add to that both children’s weight it is a quite a beast to control. Without the handbrake this jogger is definitely not suitable for hilly terrain and it may be more difficult to control on uneven terrain and at higher speed. And the biggest flaw for me is lack of suspension system. Fortunately this stroller has large pneumatic tires so it is suitable for harsher terrain, but only if you walk or jog on slow pace and short distances. It doesn’t cushion the ride and doesn’t soak up bumps like Thule or BOB joggers. Therefore this stroller is designed not for avid runners who like long distances and high speed, but rather for beginners or parents who want a stroller mainly for walking and only occasional jogging. This model has also unadjustable handlebar, however I checked customers reviews at Amazon and other parents don’t complain about it. This stroller has a lot of customer reviews at Amazon. Different color versions altogether have few HUNDREDS reviews (and most of them are positive)! 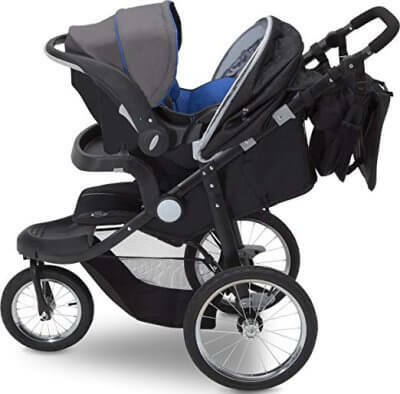 It is not a surprise this double jogger is so popular – it’s cheap and has some useful features. Here are the main assets and flaws that parents mention. 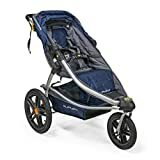 To sum up, this stroller is not so well-equipped and doesn’t perform so well for serious running like BOB or Thule joggers, however it is over 3 times cheaper than these high-end models! So compared with more expensive models Expedition performance is poorer, but when we consider it is a low price range double jogger it is satisfying. 1. If you need a stroller for all-terrain strolls and occasional light jogging, but you’re on a small budget, this model it perfect for you. 2. It includes parent tray (and some color versions also come with speakers) so you don’t have to spend extra money on this item. Even high-end models don’t include parent tray! 3. It is nicely balanced so it is not only jogger for twins, but also kids of different age and size. This low-budget double jogging stroller has few features that are very rare among joggers. It is 4-wheel construction, can accommodate two infant car seats and has MP3 speakers! 3-wheel design is typical for running strollers, however this model has 4 wheels with pneumatic bicycle tires. Front wheels are pivoting which is perfect when you use this stroller for walking. Swivel front wheels make turning and steering more easy. You can also lock them for jogging and strolling over rough, uneven terrain. 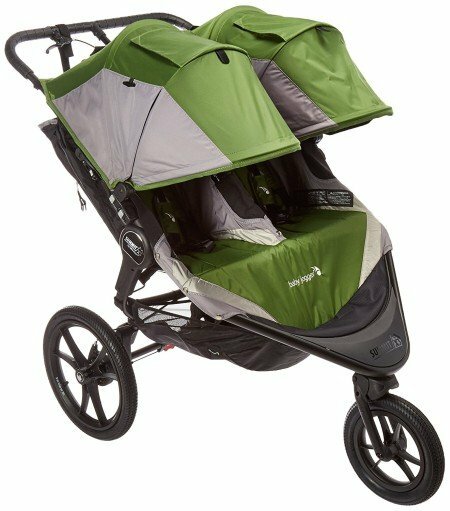 Another feature than other jogging strollers don’t have is possibility of adding TWO Baby Trend infant Car Seats. So you can use this stroller for newborn twins, stroll with it from birth and when the kids can sit unassisted in regular seats you can start jogging with them. Baby Trend Navigator Double is one of the best twin jogging strollers. 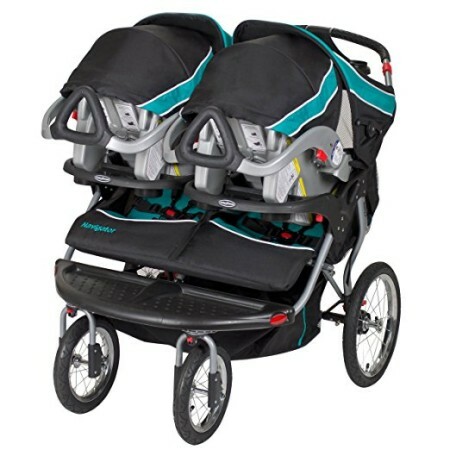 This double jogging stroller accepts two infant car seats! The main seats feature individual multi-position recline. I like the soft padding, however I’d wish the harness also had padded covers because the straps may be a bit harsh for baby’s delicate skin. Each seat has also vented top. Individually adjustable canopies are rather small, however many parents like that they can rotate forward and cover children from low sun and wind. Folding is fairly easy, you just need to pull triggers, that’s it. 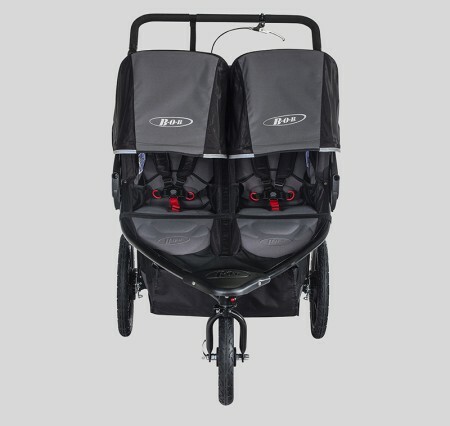 After folding Baby Trend Navigator Double still takes a lot of space, however it is typical for double joggers. I like that this stroller includes parent tray with two cup holders and small storage compartment. There are also twin child trays with holders for sippy cups and children’s snacks. This double jogger has also MP3 speakers so you can listen to your favorite music while doing your workout and jogging session. Under the seats there are two storage baskets – I would prefer one large bin, but these two are also fairly spacious and can accommodate lots of parents’ stuff. As you can see this low budget stroller has many awesome features. However there are two things that I don’t like. It doesn’t have suspension – so it’s rather not suitable for long-distance serious running. It works better for slow jogging and long all-terrain walks. Also it’s a bummer it doesn’t have a handbrake, because it is very heavy (43 lbs) and controlling it on uneven or hilly ground is pretty difficult, especially when you jog with heavy toddlers. I wouldn’t recommend it for jogging downhill or very difficult terrain. Good thing is that is has nice parking brake operated by foot (not flip flop friendly) and a strap for runners wrist. 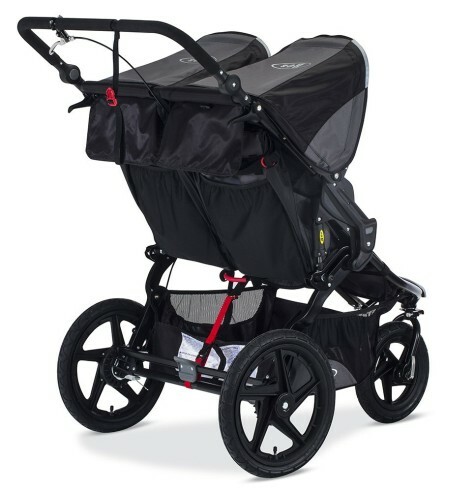 This is one of the most popular and best-selling double jogging strollers on the market. It has over two hundreds reviews at Amazon (at least at the moment of writing this review). Here are the advantages and disadvantages, based on customer reviews. Big pneumatic tires cushion the ride, but it is not as smooth as it would be with a typical suspension system. 1. This is probably the only reliable double jogging stroller that can accommodate two infant car seats. So you can really use it since birth (for walking) as a stroller for twin newborns and from 6 month start using it for jogging. 2. It works not only for twins, but it is also great jogging stroller for infant and toddler or toddler and preschooler. 3. It’s a low-budget option and in addition it comes with accessories: parent console, children trays and MP3 speakers. It’s really awesome that you get those items at such a low price and don’t have to pay extra for them. Do you like this stroller? Before you decide to buy it make sure to check available discounts and read what other parents who own this stroller wrote about it at Amazon. I decided to include in my ranking something for most active parents who are not only running, but also rollerblading and riding a bike and they would like their children to accompany them on all of these adventures. If you’re spending a lot of time outdoors on various activities, multi-sport trailer may be a better choice for you than a jogging stroller. What features a trailer has and why parents may want to buy it? Let me tell you more about this type of baby gear by presenting one of the best trailers in the market. This is one of the few Thule multi-functional trailers that are suitable for different outdoor activities, including jogging. They have two newer models suitable for running – Thule Chariot Cross and Thule Chariot Lite but they are much more expensive. I chose Chariot Cheetah XT because it has a great combination of features and it’s more affordable. PRO TIP: If you’re wondering which Thule multi-sport trailer you should choose I recommend you getting the Chariot Cheetah XT over the Chariot Lite, because it has almost the same features but it costs a lot less. For our family Cheetah XT was sufficient. If you’d prefer something with even better equipment (like reclining seats, adjustable suspension and storage basket) choose the Chariot Cross. It is expensive, but it’s hands down the best equipped multi-sport trailer out there! This trailer is designed for 4 activities. You can connect it with your bike, you can stroll or jog with it or even ski with it! For each activity you need special attachments and/or front wheels. Strolling and bicycle kit is included with the trailer, for skiing you need to purchase separate kit. For jogging there is a kit sold separately as well, and it includes big front wheel. This is a ranking of the best strollers for running in 2019, so I will focus on the features related to this activity only, but remember that this trailer is multi-sport. The wheels have pumped tires and the trailer is equipped with a suspension. The trailer doesn’t stick up on cracked in sidewalks and handles multiple types of terrain. Note that the front wheel is fixed and you can’t unlock it. This makes the trailer really stable which is very important when you’re jogging at higher speed or going over bumpy terrain. But it also makes it harder to turn in tight corners, not only because of the non-swivel wheel, but also because of the very long wheelbase! Generally speaking Thule Chariot Cheetah XT is maneuverable and you can push it with one hand, but in crowded, narrow spaces it can be more difficult to steer it. One more thing: the wheels are very similar to bike tires so they can handle unpaved terrain, but not very bumpy. Parents won’t have problem with controlling it, however the baby may be bouncing around a bit, when you hit a bump. Now you may want to ask, for whom this jogging trailer is designed. Well, it’s ideal for serious runners, especially those who train for marathons or simply like long distances. Large (16″) stable front wheel makes it perfect for higher speed. So with the one front wheel this trailer is meant strictly for running, for daily use you should definitely switch to two small front wheels to make the trailer more agile. PRO TIP: At Amazon you can purchase Thule Chariot Cheetah XT trailer with jogging kit in one go (click). You can get Thule Chariot Cheetah XT in two versions: single and double, depending on how many kids you want it to accommodate. What’s very important the single Chariot Cheetah XT has capacity of 75 lbs, but the Thule Chariot Cheetah XT 2 has weight limit of 100 lbs. Considering this the single model may serve you longer and can accommodate larger/older child. Another noteworthy thing is that these two trailers differ in weight – single Chariot Cheetah XT weighs only 19.4 lbs (it’s lighter than many single strollers for running! ), while the Chariot Cheetah XT 2 weighs 26.5 lbs. Double version is also 5 inches wider (31.5″). You should keep that in mind because it’s wider than normal doorways. And depending on the model you choose, inside the trailer the is one or two padded seats, each with 5-point harness to the kiddos safe during your outdoor training. The trailer is roomy enough to accommodate 7-year-old kids! Important thing: The trailer is not suitable for infants. You can add a sling for small baby (for strolling mode), but in general this multi-sport trailer is the best choice for older kids – 2-7-year-old. Depending on the weather conditions you have two flaps that roll back easily not needed. The front window of the trailer can stay open, you can cover it with a mesh screen (ideal for areas where there are a lot of bugs like mosquitoes) or a rain shield. There is also possibility of covering the top of the trailer with a canopy that has a small sun visor – it will keep the sun out of the passengers eyes. Top of the backrest is mesh so it allow the air to circulate through. It’s a great addition because generally speaking in summer in may get hot inside the trailer so the vents are useful. On hot days I usually leave the trailer in open-air mode. What I also like about this trailer is the reflective material that keeps you and your little adventurers more visible at low light. Do you like jogging in the evening? With Thule Chariot Cheetah XT it won’t be a problem! Another useful feature is the height-adjustable handlebar. If you’re a petite mom like I am or your hubby is much higher than you are, you’ll appreciate this feature for sure. I hate running with strollers that have non-adjustable handle, because I always end up with neck and wrist pain (which is frustrating when you’re jogging!). The biggest drawback for me is the lack of the storage basket – there are only mesh pockets for a few small essentials. This means you won’t be able to take your diaper bag with you, or you’ll have to carry it somehow. Another thing – the seat is doesn’t recline at all. Below you can find a quick summary, for whom Thule Chariot Cheetah XT is designed. If you’re considering buying it, I recommend you to read customer reviews and see what parents who own it, think about it. It can be used only for children who can sit unassisted and are at least 10 months old. If you want to stroll with younger baby in Thule Chariot Cheetah XT you will need this infant sling. 1. It’s one piece of baby gear that is suitable for different outdoor activities: jogging, strolling, riding a bike and skiing (less things to store). Perfect for parents who love sport. 2. It’s one of the lightest multi-sport trailers (both the single and double version). When our daughter came into the world, we knew we wanted to encourage her from an early age to physical activity. And the most important: we wanted to spend with her as much time as we could, but without giving up or sacrificing our passion. To do that we needed a stoller we could run with. And when Haley was born we made a decision: we are buying a jogging stroller. We knew a lot about jogging, but not about jogging strollers. We did a lot of research, read many reviews and tested couple of models. After few months we finally found the right jogger for us. For us, as for any other parents the most important thing is our baby’s safety and comfort, which is gaining importance especially during strolling and running together. We also know that the stroller specification won’t tell you everything. The most important is baby’s safety and how the jogging stroller works on different terrains. Birth of a child is life-changing. But the fact that your life is focused on the baby, doesn’t mean you have to give up your hobby. Of course you will have less time for training, but proper time management and proper equipment will make it easier for you. Thanks to jogging strollers we can spend time with our babies outdoors in an active way. It can be fun for your whole family. You don’t have to give up running when you have a little baby. I will help you to continue your hobby. Choosing the right jogging stroller is not an easy decision. I tested and reviewed well-known brands, solid and high-quality products that guarantee the safety of your child and excellent driving comfort. If you want to find out how to choose a jogger, I invite you to read my buying guide and jogging strollers reviews. And if you ever get lost in the world of joggers, let me know and I will try my best to help you! Buying a standard stroller requires careful reflection on what we really need and what features will meet our expectations. When we are looking for a jogger the task is even harder, because we will be running, so the baby will be exposed to more bumps and shocks than during a stroll. We have to find super-safety and comfy vehicle so our little one could join us during running! Most of the joggers has three wheels with pumped tires. Thanks to large and “bicycle” wheels joggers handle any type of terrain. Besides, usually they absorb shocks very well, so the passenger doesn’t get bumped, even during riding over the tough ground. Air-filled tires requires regular pumping. Don’t worry! It’s easy and you can use a standard bike pump to do that. Many strollers for jogging have special suspension system. BOB Revolution joggers have THE BEST suspension I have even seen and tried. They provide such a smooth and comfortable ride, that my kids always fall asleep, no matter if I’m running on grass, beach or bumpy county roads! I know that some parents go for a bumpy ride to get their baby fall asleep. However, remember that babies have delicate spin and head, and strong shocks aren’t good for them in any way! That’s why the proper suspension absorbing shocks is such an important features in joggers. Another feature that we should look for when buying jogger is handbrake. Parking brake is a standard, but hand-operated brake is pretty unusual, so I find it a big advantage. Having a hand brake is very useful especially if we often run through hilly area. This brake gives you more control on the speed during jogging down the hill. Of course not every jogger has an additional, hand-operated brake. 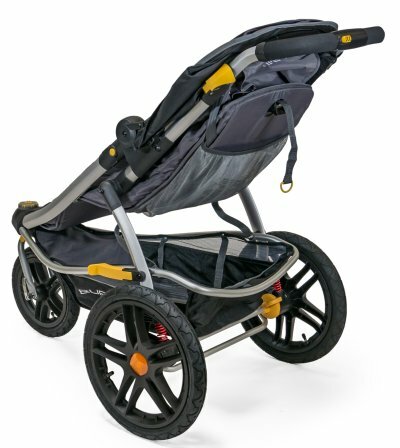 For me this is one of the most important thing in strollers designed for running. But that’s my opinion because I’m a big fan of off-road jogging over hilly terrain. Remember that joggers are designed for running, so the most important is yours and your baby comfort and safety. This is additional safety feature that most of the jogging strollers have. The strap (leash) is attached to the handlebar and you can put it on your wrist. It prevents the stroller from getting away from you. Safety tether is a must-have for parents who like to jog downhill and at high speed. Usually jogger are pretty big, even after folding. They often weighs around 25-35 lbs which can be quite a lot for some women, especially if you have to bring the stroller up the stairs every time. You should keep that in mind, if you had or will have a C-section. Another important thing – we can run with our babies when they have proper neck and head control and can sit up. Before that we can still use the jogger for strolling but only with an infant car seat. 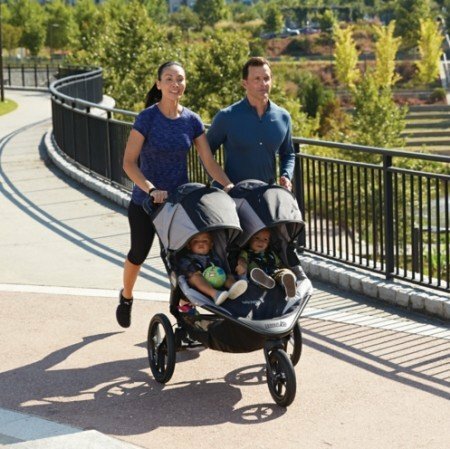 Do you have a recommendation for a triple jogging stroller? I have an almost 2 year old daughter and twins on the way. I would love to be able to take all 3 of them jogging once the twins are old enough. My daughter runs with me all the time now. The only triple jogging stroller that I’ve heard of is BeBeLove Triple Jogger, but I haven’t tested it, so I can’t help you with that. I’m not quite sure it would be comfortable to run with a triple stroller as it’s really wide = hard to turn and steer. BeBeLove stroller has also fixed front wheels which is okay if you’re jogging at higher speed, but it also decreases stroller’s maneuverability. I have three kids too and there are two solutions we came up with. When the twins turned 6 or 7 months old, my husband was running with them in a double stroller, and I was jogging with our daughter in a single stroller (she was 3 y.o. back then). If I was on my own and wanted to go out with the three of them, my daughter was riding her tiny bike and I was jogging with the double BOB Revolution Flex. So informative and helpful! I see you reviewed two of the Graco strollers. What about the Graco Roadmaster? Seems to be less popular / have way less reviewers than the two you reviewed, BUT seems to be much lighter than those two. I wonder if it is without shocks. Wondering if you have any thoughts on this model? Hi Jennifer! FastAction Jogger has been on the market for about 5 years (!) or so – much longer than Roadmaster. It’s definitely one of the reasons why it’s more popular. Now there’s so many jogging strollers on the market, it’s hard to stand out 🙂 In my opinion the Roadmaster is a bit upgraded version of FastAction stroller (the update is slightly smaller fold). It doesn’t have suspension like BOB or Thule strollers (but it’s also few time cheaper..). It has air-filled tires and they do cushion the ride. But because of the lack of suspension I would recommend it rather for occasional jogging and short distances. On bumpier road or at higher pace you would notice a difference between this model and for example BOB Flex (in terms of smoothness). Oh, and Roadmaster weight is actually similar to Graco Relay Jogger- 28.2 lbs. Hi! I want an inexpensive travel system with a safe infant car seat and a jogger that can be used on a variety of surfaces–including the indoor mall, snow, and uneven sidewalks–for strolling, power walking, and slower jogging. Would you recommend the Graco Relay or FastAction? One has typical air-filled tires (which need to be maintained but are supposed to be better, correct?) and the other has pneumatic tires but a better suspension system according to your review? Do you recommend one over the other? Thank you! I also prefer the canopy on Relay – it extends further and has additional sun visor. I think it’s important feature because usually kiddos hate sun in their eyes. One major drawback of Relay is that the front wheel is a bit hard to inflate because most of pumps don’t fit the tire. In customer reviews on Amazon some parents recommend proper pumps that fit the front tire. Both strollers come with the same car seat – Graco Snug Ride Click Connect 35 which is one of the most popular infant car seats in the US. However, I didn’t review it so make sure it meets your needs. I have a Graco Click Connect car seat and it’s awesome! 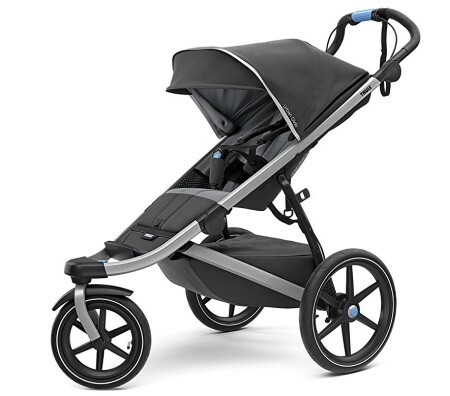 I unclick it from the car seat base and click it right onto the best jogging stroller HQ. It’s a 10-second transfer! You don’t need an expensive stroller and car seat to have the greatest convenience ever in my opinion. And you get the same safety features as you would in an expensive purchase. I am curious if you have tried the Thule Urban Glide – Double and, if so, how it compares. It also receives some very good reviews and apparently there is a new version arriving soon (Amazon has a pre-order option for the Thule Urban Glide 2 – Double). 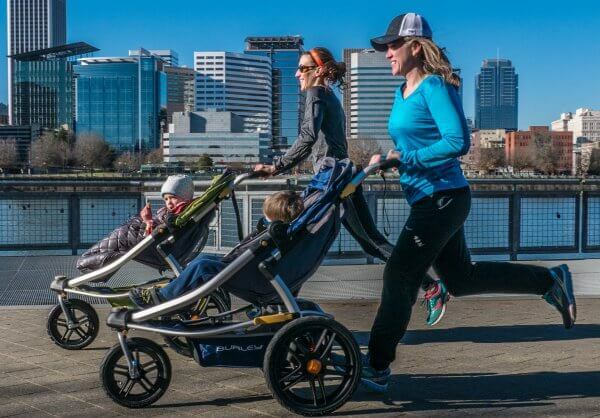 It is an awesome stroller, definitely great choice if you’re a serious runner. It has useful handbrake so you could control it during running – when you add the weight of the stroller and weight of two kids it is a “beast” to control 🙂 However, it is one of the lightest double joggers. It has also great suspension that soaks up bumps and it really feels light to push and turn even with two toddlers. I love the padding on the seats and harnesses (it’s super soft, one of the most comfortable among joggers). And the canopies! They extend far down and cover babies knees. But keep in mind, this stroller is not suitable for tall kids (I would say it will last 3 or 3.5 years). I saw that Thule is releasing 2.0 model and there is pre-order on Amazon, however I’m not sure if this new version is going to be better than the current one. 2.0 model is heavier – about 2 lbs – it may seem a little, but if you are going to put this stroller in and out of the car trunk frequently, these 2 lbs really matter 🙂 The handbrake is also different in 2.0 model, not like a bicycle handbrake but it’s a twist brake. I’m not sure if it’s convenient to use. And the price is about $40 higher. So actually I would even recommend you the current model. I also checked today and the red version is over $200 cheaper which is really great deal for such a “heavy-duty” and well equipped stroller. Here is the discount, however I’m not sure how long it will be available. I have a 4 year old and having my second child in January. I was hoping to buy a jogging stroller for around 200$ which I see they have one at Babies r us but looks like they are not adaptable to baby seats. What do you suggest? To be honest, there are not many good double jogging strollers at this price, especially those that could accommodate 4-year-old child. Unfortunately this type of stroller is rather expensive. I can recommend you Baby Trend Navigator Double Jogger, it’s suitable for older kids and you can attach an infant car seat for your newborns as well. It costs about $220 on Amazon. It’s a good quality for low price. 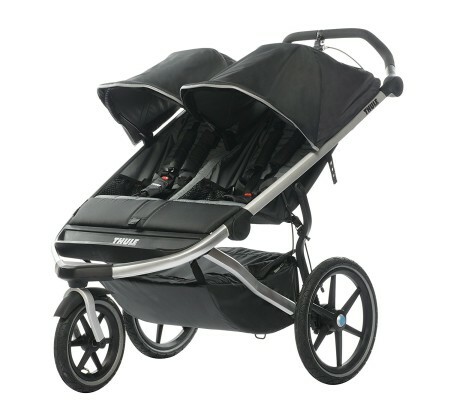 There are also two other double jogging strollers: BOB Revolution PRO Duallie and Thule Urban Glide Double. 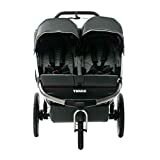 These are absolutely the best two strollers in this category, however they are much more expensive (BOB is about $700 and Thule costs about $550 on Amazon).